FPGA Boards with SMPM VITA 67.3 Connectors Deliver Superior RF Density and Speed to VPX Backplane - Annapolis Micro Systems, Inc.
WILDSTAR Radial Clock Distribution Board (WP6C20) with two VITA 67.3 Connectors, circled in red. 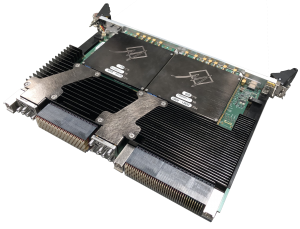 Annapolis Micro Systems, a leading FPGA board and systems supplier, is now integrating SV Microwave’s SMPM VITA 67.3 Connectors in multiple high-performance COTS boards, for maximum RF signal density and speed to the VPX backplane. The SV Microwave RF connectors are a dense and rugged high-speed coax solution that is aligned with the SOSA™ technical standard. They are available in 11- and 14-port modules that accept up to Ø.086” coaxial cable, with SMPM minimum pitch of .228”. These boards are shipping now. 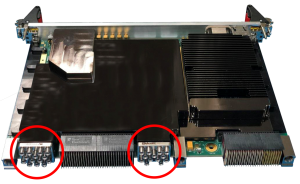 WILDSTAR 6XB2 6U OpenVPX Board (WB6XB2) also integrates two SV Microwave connectors. The VITA 67.3 connectors mount side-by-side with other standard VITA connectivity, including VITA 66 optical connectors and MULTIGIG RT3 connectors, which support a remarkable 25Gbps. This entry was posted in Featured News, Press Releases and tagged wildstar fpga boards, SOSA, sv microwave connectors, vita 67.3. Bookmark the permalink.